Domo, which provides a platform to help executives aggregate multiple sources of merchant data and provide insight for better decision making, announced that eBay and its employees have begun using their solution. eBay has more than 128 million monthly active users (MAU)across the globe, generating a vast amount of data. eBay account managers need to understand how their retail/merchant clients are performing in terms of sales and how they can assist in optimization efforts. The problem in the past, however, was that the information eBay managers needed was often difficult to acquire as it resided in multiple systems (and in various formats). "Before Domo we were sending out Excel files and links to different places, and we built out a few dashboards, but at the end of the day they weren't dynamic," said Kevin Styers, manager of merchant sales operations at eBay. "It was very one dimensional." After implementing Domo however, the digital life of eBay employees has been made a little easier. "It was much simpler to get disparate data sources into the system than I'd ever imagined," continued Styers. 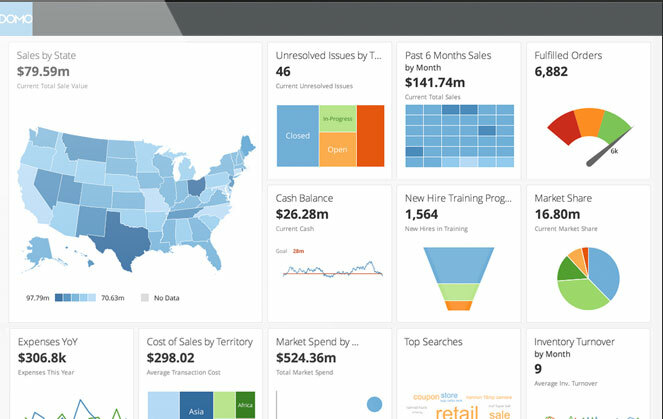 "Now Domo is our one-stop shop when we're looking for any kind of analytical trends. It's been hugely beneficial to our decision-making process."